Beginning in spring 2019 the Forest Preserve District of DuPage County will continue a large-scale restoration project along Spring Brook — a tributary of the West Branch of the DuPage River — that runs through Blackwell Forest Preserve in Warrenville. A part of the regional trail and the youth-group campground at Blackwell will be closed through 2020. Campsite availability at the family campground will be limited in 2019, although there will be some openings on select Friday and Saturday nights. Construction is anticipated through late 2020 or early 2021, and crews will continue to manage the vegetation and prevent invasive species from establishing after construction ends. View the Spring Brook No. 1 Creek and Wetland Restoration — Phase 2 Project Map (PDF) or the Spring Brook Phase 2 Presentation (PDF). The restoration project is funded by the Illinois Tollway and will mitigate impacts from rebuilding the Central Tri-State Tollway I-294 (link). Since 2015 the Forest Preserve has worked on a stretch of Spring Brook Creek upstream at St. James Farm Forest Preserve in Warrenville. Fish and freshwater mussels are now able to move further and further upstream, and wildlife — including spotted sandpipers and native hibiscus — are benefiting from a revitalized habitat. Visitors not only enjoy the sounds of the babbling creek but also the opportunity to view native plants and animals. View the Spring Brook No. 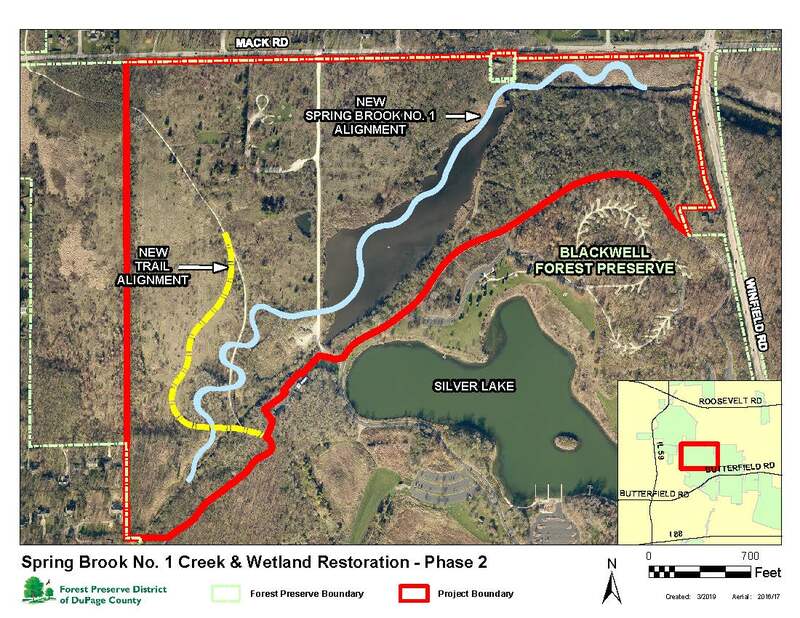 1 Creek and Wetland Restoration — Phase 2 Project Map (PDF).